With Avengers: Endgame looming on the horizon to put an epic end to Marvel’s 22-movie Infinity Stones storyline, it’s hard to comprehend the fact that the MCU will, in fact, continue right along once the dust has settled into a Phase 4. 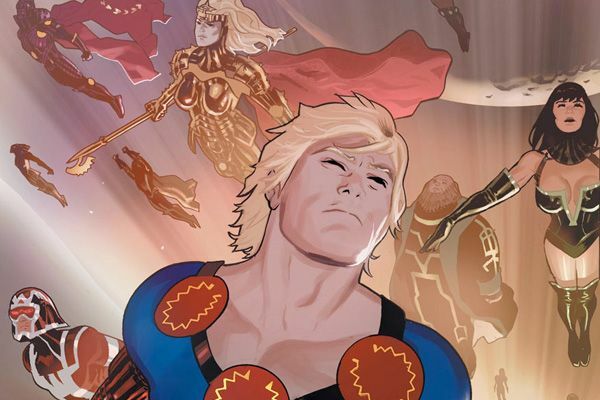 One of the more low-key (not Loki) exciting projects being discussed is Eternals, a big-screen adaptation of the Jack Kirby-created celestial beings that count Thanos the Mad Titan as one of their own. Not much has been said since the studio set screenwriting duo Matthew and Ryan Firpo on the case last May and The Rider helmer Chloe Zhao to direct last September, but our own Steve Weintraub managed to get a bit of an update from Marvel president Kevin Feige during an interview at the press day for Captain Marvel. According to Feige, the plan is not only to introduce the Eternals as a full ensemble Guardians of the Galaxy-style, but to also lean into what made Kirby’s run in the 1970s so complex.